Do you feel like you’re fighting a losing battle with the amount of dirty clothes and dishes piling up in your house? It can be frustrating when you're faced with a mountain of house work so you'll be delighted to hear that B&M's Big Clean Event has started in-store! We've picked out some of our best cleaning products to help ease the burden of housework, so you can spend less time cleaning and more time with your feet up. First thing’s first, you’ll need to make sure your dishwasher is as clean as it can possibly be. In order to make your dishes shine like new again, the machine that’s washing them needs to be fresh. How about using some Finish Dishwasher Cleaner? The 250ml bottle has a hint of lemon so not only makes your dishwasher clean, but leaves a lovely, fresh scent. Cleaning deep within the machine, attacking hidden grease and limescale, you’re now ready to get rid of that massive pile of washing up! 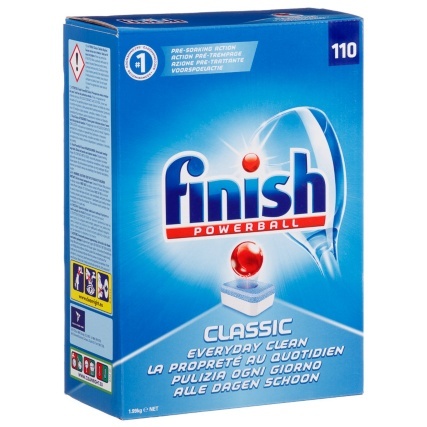 At this stage you have plenty of choice when it comes to what cleans your dishes, but try Finish Powerball Classic. The 110 pack of capsules will last a long time, while the tabs themselves soak and soften tough food stains as powerful detergents remove all traces of food. Finish Powerball All in 1 Max is a tad stronger, as it has the cleaning power to remove particularly stubborn baked-on foods from your dishes. Whichever one you choose, the finising touch has to be Finish Rinse Aid. This particular cleaner works during the rinse-cycle, thoroughly clearing away any detergents left behind, quickening the drying process and removing any water from your dishes. For hassle-free and speedy dishwashing, start with Finish! Now that the dishes are clean and put away, it’s time to tackle that ever-growing pile of clothes. Separate them out into colours and whites first, then choose your load. If it’s the colours, and there are pesky stains to get rid of, grab yourself a tub of Vanish Colours Powder Stain Remover. The powder can be used as a pre-treat cleaning measure, a soak or in-wash. Its powerful cleaning action removes stains and makes your clothes look like new again. Once the coloured wash is complete, repeat the process with the Vanish White Stain Remover for all of your white fabrics. Now, sit back and relax in front of the TV, safe in the knowledge that all of your dishes and laundry are sorted! Have you noticed any other amazing cleaners in our Big Clean event? If so, let the B&M Community know on Twitter, Facebook and Instagram.